Ok. I'm locking in what I want for the draft. Two options, in order. 1. Trade back from 4. 2. If staying at 4. Then in this order, I prefer Nick Bosa (won't be there), Quinnen Williams, Josh Allen, Devin White. Bosa should by all accounts go second to the 49ers. Unless they balk at his Pro-Trump tweeting (kidding!) Williams has a shot at hitting 4. But could be snagged at 3 by the Jets. Allen and White should both be there at 4. However if the Raiders find a trade partner and move back a few spots (I haven't spent any amount of time looking at the validity of this) and still land White. I'm all for it. Listening to and watching the press conference, Mayock was answering a direct question. To me the answer was more to speak to the fact that you don't discount a prospect because of who is on the team. And he was speaking to the evaluation, due diligence and need to make the best decision for the team throughout the draft process. Unfortunately it happened the question and answer included the QB position... in already muddied media waters. The move we all saw coming has been made official. Seth Roberts has been released by the Raiders. That WR Group has undertaken a pretty aggressive makeover compared to where the team was this time last year. 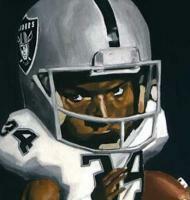 The Oakland troubles which threw uncertainty into the mix for where the Raiders would play in 2019 may lead to a direct benefit to ME! The Winnipeg Football Club (local organization here) is in talks to bring a NFL preseason game to Winnipeg... one that would feature the Packers and Raiders... The date they are looking at is August 23rd, which would be the 3rd week, and arguably the best preseason game to watch. Never the less, to be able to watch the Raiders in my hometown about 45 minutes away from my house is AWESOME! Agreed. They also find themselves in a unique situation where they can draft the rookie QB the HC covets and get the full 5 years with their new QB, with the added benefit of *maybe* getting a 1st round pick back for Rosen, or equal value. Thereby really offsetting any loss on previous investment. Not to many teams get that chance to do a full reset, IMO they'd be silly to not do this if they have any remote doubt that Rosen is not the guy. Had to look up the pick for the Bengals. They pick 11th overall. I'd imagine it would be quite a trade to get from 11 to 4. Using the Classic Jimmy Johnson Valuation chart: Pick 4 is valued at 1800 Pick 11 is valued at 1250, The bengals 2nd round pick is 42nd overall and is valued at 480. Maybe a swap of firsts, a 2020 First and a 2019 3rd? Just spit balling here. Oooh, I forgot about the Brown/Burfict back story... good call! FBGs New Blog has 2 stories that indicate the Raiders have interest in Free Agent LBs Vontaze Burfict (Bengals), Manti Te'o (Saints), Aaron Lynch (Bears) and Brandon Marshall (Broncos). I really hope Burfict stays away. Can you imagine the field day the ref's and the NFL would have in penalizing him if he wore the Silver and Black? My god. For some reason I thought Burfict was older then he is. All 4 are in the 28-29 age Range. But Burfict has an extra season under his belt compared to the other 3. Looks like Lynch spent most of his time as a DE w/ the 49ers. J.J. Nelson is your new Oakland Raider. At some point I figure they will start addressing the D-side of the ball. Well STC, you don't have to worry about Feliciano next season... he has moved on to the Buffalo Bills. Maybe Jordy requested the release of there addition of Brown and Williams? And the Raiders granted his wish? Not big news, but Raiders news none the less.... AJ McCarron has reportedly been released. Contract Value in the Free Agency Market is very fluid and extremely subjective. It isn't simply paying for the player and the value to the team. That cost is inflated by other factors such as other teams bidding on him, the difference in other players currently available at the same position, age, years played, injury history, the picks the team has in the up coming draft, the current players and their contracts at the same position, etc. Hell even the continued increase of the salary cap plays a massive role making it very hard to compare contracts year over year. 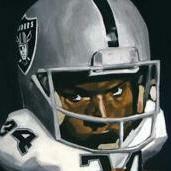 All I know is that Williams is a clear upgrade at the WR2 spot for Carr and the Raiders. Provides flexibility for the Raiders in what to do with Roberts. I trust the organization now (couldn't do this during the last of the Al Davis years) that the contract won't limit or restrict the Raiders in acquiring more talents. IMO, the best part of the recent acquisitions, is the flexibility it gives Mayock and Gruden come draft time. They have addressed major needs in the roster, and still have their top 4 selections in the draft. They are in a position to take the best player available or move around the draft as they see fit. Love that. Wonder if the addition of AB and Williams will raise Cook's interest in re-signing with the team?